Still more Romanian than you! It’s not often that I get completely caught by surprise, but this week was a rare – and pleasant – exception. The Unsleeping Eye brought it to my attention that the ABC legal drama “For the People” ran an episode last week, and the A-plot revolved around “Transnistria”! I’d never seen or even heard of this show before, but I had to give it a watch. In my opinion, it’s a rather middling drama about the lives of some federal prosecutors working in New York City. Some of the actors were rather flat, but I have to say that Jasmine Savoy Brown really stood out. I remember her vaguely from “The Leftovers” as the whiny kid who disappeared, but now that she’s an adult with a full head of “natural” hair, she really shines. Oh yes, back to the plot! 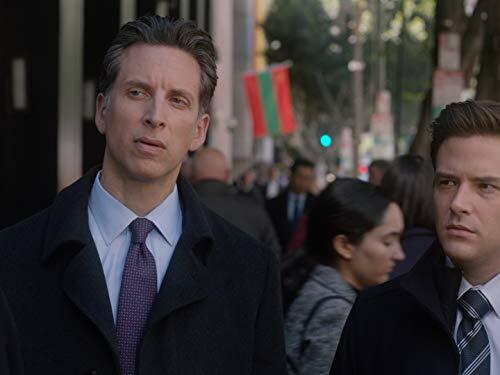 The episode’s A-plot involved a pasty, somewhat incompetent prosecutor named Seth Oliver (played by Ben Rappaport) who wants to try a case so that he can get a promotion. A “Russian” style thug whose name is inexplicably spelled “Carpov” (as opposed to Karpov) is hauled into court by Oliver for assaulting a federal agent. But it turns out that Carpov is actually … wait for it … a “diplomat” from Transnistria! Throughout the entire episode, they treat Transnistria as though it were a recognized, sovereign country with a diplomatic mission in New York City (mistakenly referred to as an “embassy” rather than a “consulate”). As such, Carpov is immune from prosecution. This leads Oliver on a convoluted hunt to try and get Carpov’s diplomatic immunity waived. Part of this involves a big meeting at the Transnistrian embassy, where you can see both the PMR flag behind everyone as well as the “ambassador” wearing a small PMR flag lapel. Nice choice to use a woman as the ambassador! After the meeting, Oliver and his cronies walk down a street in New York City, and you can see the PMR flag behind them. Later, we find out that Carpov is addicted to cognac (inexplicably pronounced “cone-yak” by all the American actors). Oliver uses Carpov’s fondness for cognac to get him to come out of hiding and arrest him. There were, of course, a lot of issues with the facts. First, of course, Transnistria doesn’t have an embassy in the United States as it has never been recognized as an official country (although they’re working on it). So all of the story about diplomatic immunity, et cetera is nonsense. There’s also some nonsense about how Transnistria is a key ally of the United States at the United Nations when it comes to votes about fisheries and other issues. Even weirder, Carpov at one point takes refuge in the Embassy of “Cordoba”, which, of course, is a completely fictional country. But at the end, there is a line about (the Republic of) Moldova possibly attacking Transnistria, which is quite real. The episode was written by Eli Attie, a guy famous enough to have his own Wikipedia page. You might remember him as one of the writers for the TV show “The West Wing” or that he used to be a speechwriter during the second Clinton administration. Clearly, somewhere along the line, he at least heard of Transnistria (and its fondness for cognac) and the situation with Moldova and recycled it into the plot for “For the People” that aired last week. Overall, quite an interesting turn of events. As far as I am aware, this is the first time in history that Transnistria has ever appeared on a fictional TV program or movie (in English). Of course, Transnistria was portrayed as a country where Russian-speaking thugs frequent strip clubs and guzzle down expensive cognac, but hey, it’s still quite a milestone. And the cast learned a tiny bit about Transnistria! Idiots who made that serial, just like you. this made me google and learn something about Transnistria. Before this I had never heard of such a place. Do you have any blogs with more information about it? I’m More Romanian Than You! You might be born in Romania, carry a Romanian passport and know ALL the words to Partidul, Ceausescu, Romania... but guess what? An in-depth look at Romania, Moldova, and Transnistria by an American who has lived in the region for more than 15 years. Mihai Pascu on Why Do Romanians Hate and Fear Russia? Tataie on Why is Romania so poor? Top Clix for Chix with Dix!